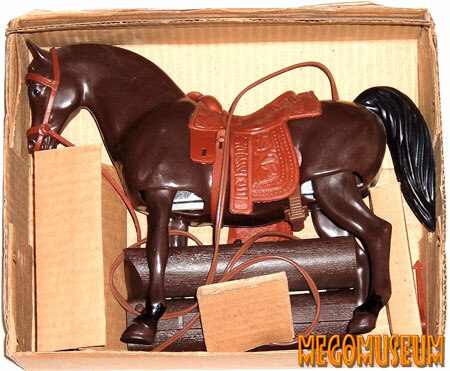 Thanks to our pal Corey LeChat we have this beautiful mailer box Action Stallion in the Museum Galleries. 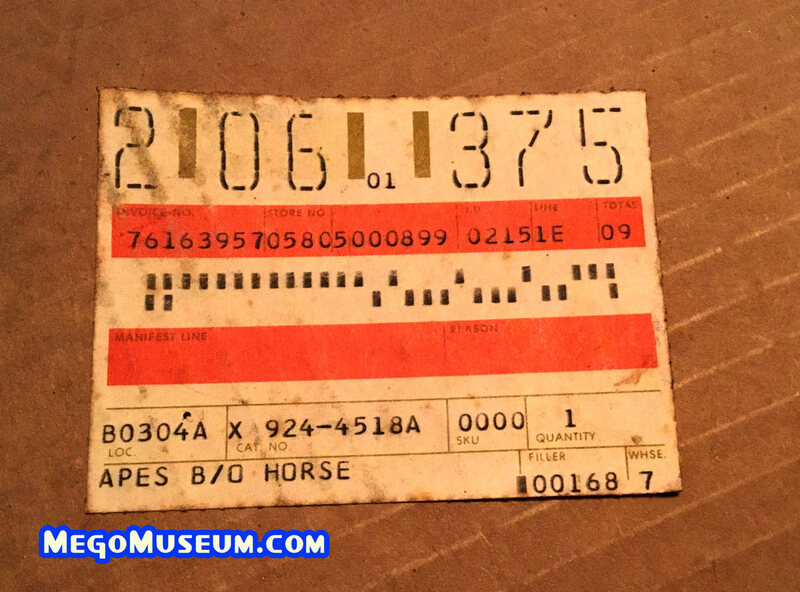 While not as widely collected as regular packaging, mailer box items are coveted by a segment of collectors and stuff like this is very hard to get. I’m geeky enough to know that this is from the JC Penney Catalog of 1975. 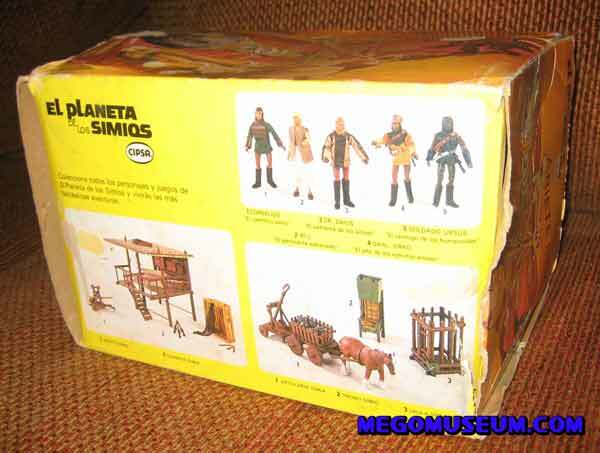 Mego Christmas Catalog Section of the Museum. 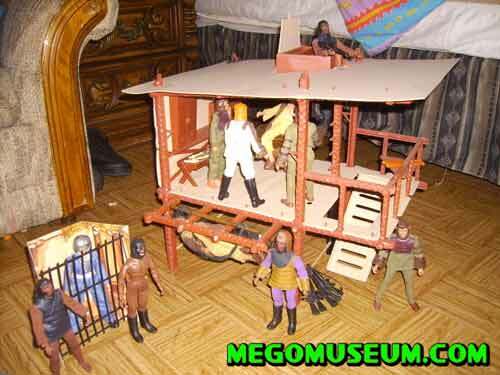 Mego Waltons line but it never materialized. 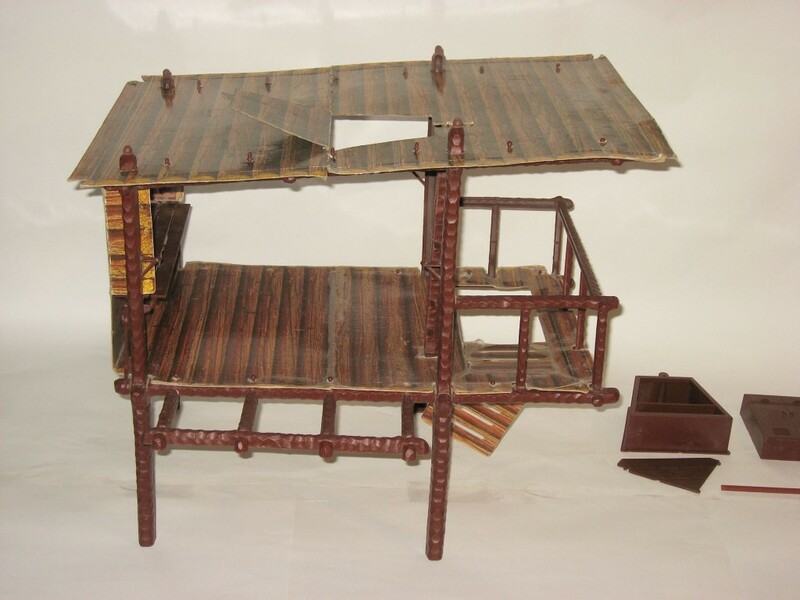 Thanks to Mike D’Aloia we have pics of the Mexican version of the Battering ram which featured some snazzy redrawn artwork. 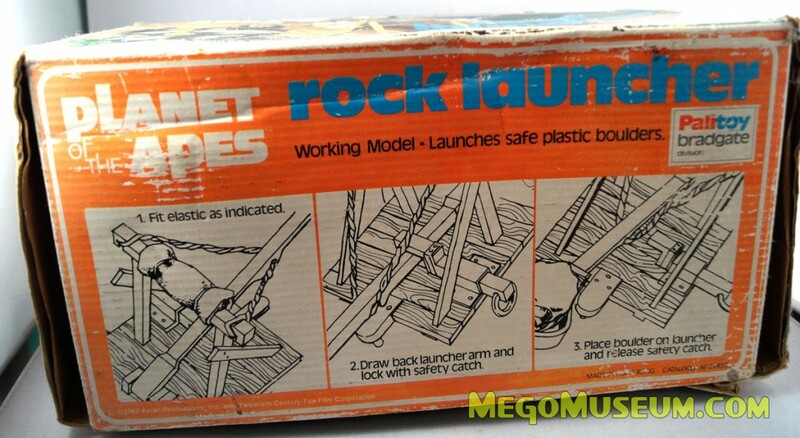 but the packaging is much different. 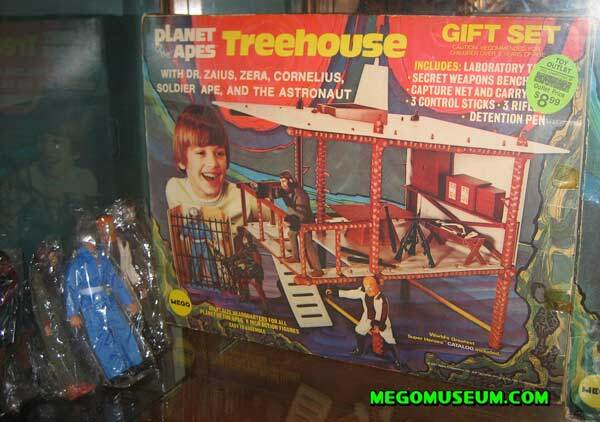 Here is the box which features an unhappy looking astronaut Burke. 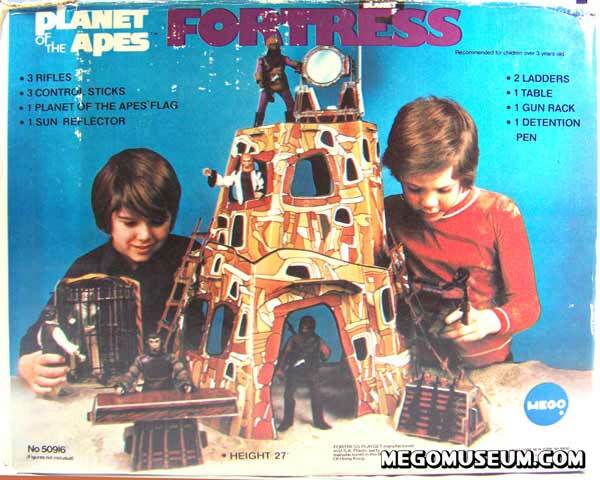 A boxed Planet of the Apes Fortress is the largest item in the collection. 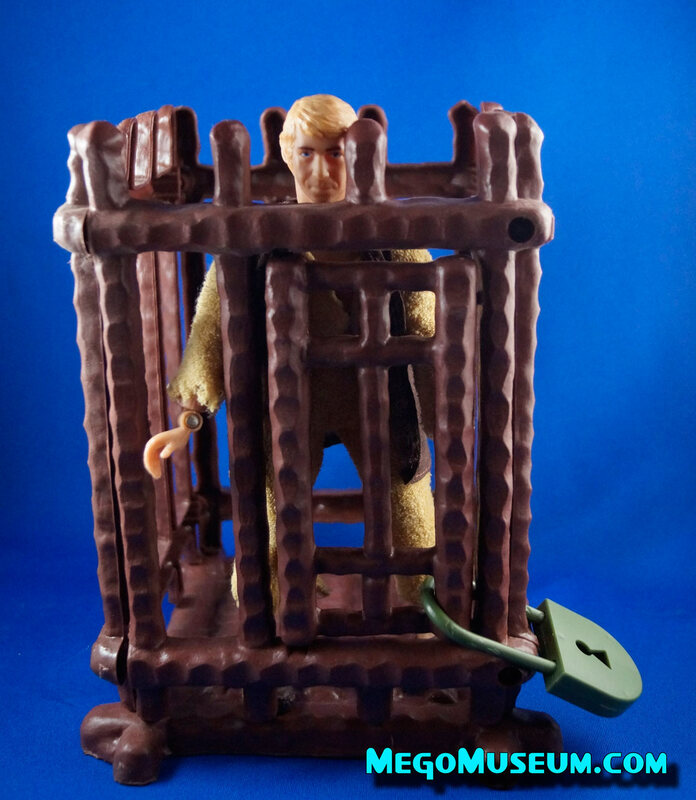 Alan Verdon models the unique jail cell for this playset, which is sturdier than the cage included with the Treehouse playset. 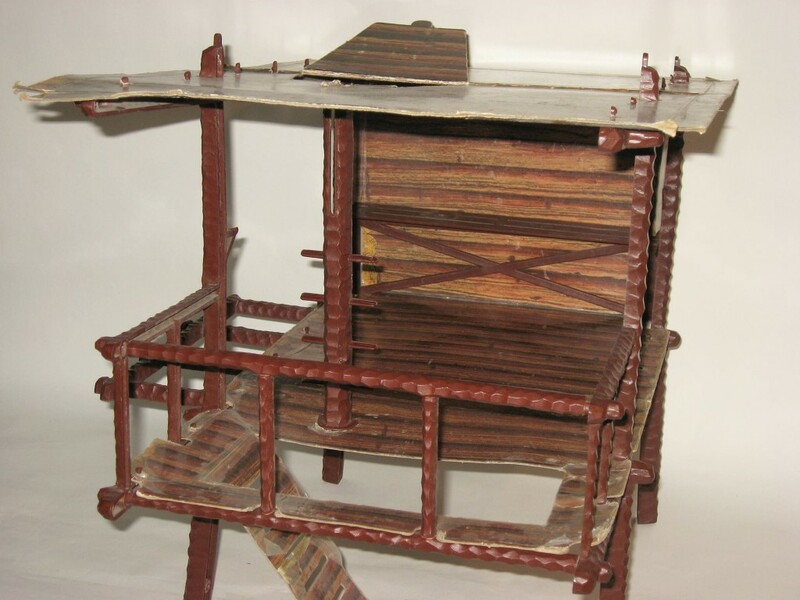 Alan models the “work table”, it seems pretty morbid that we as children got so many opportunities to reenact vivisection scenes. 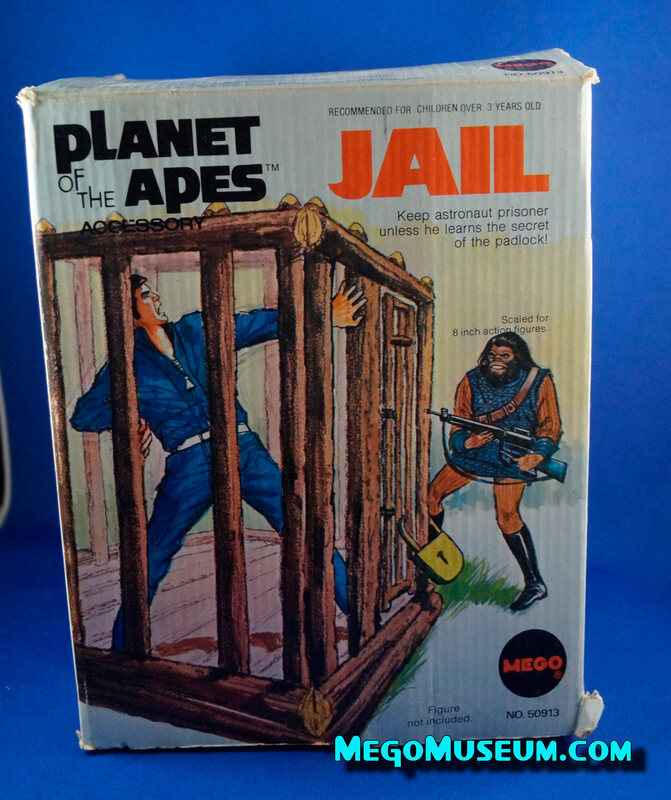 The jail is a logical addition to this line of lower cost items, seeing as the jails in the playsets are usually cardboard. The secret of the padlock would take a child about five seconds, seeing as it took me about ten to figure it out. 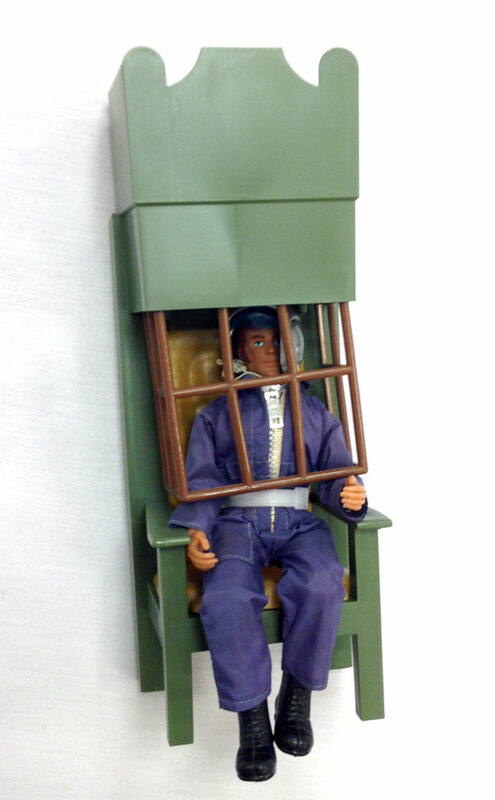 Here is the Astronaut tucked away in his cell. 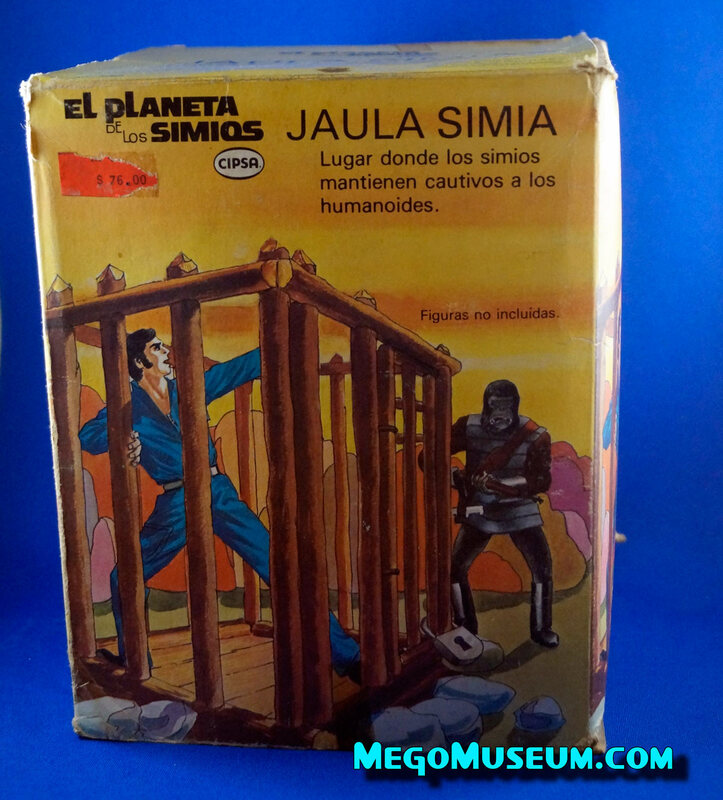 Pictured above is the Mexican Cipsa release for the Jail (now known as Jaula Simia) with artwork retouched from the US release, the Soldier Ape has been replaced with Ursus. 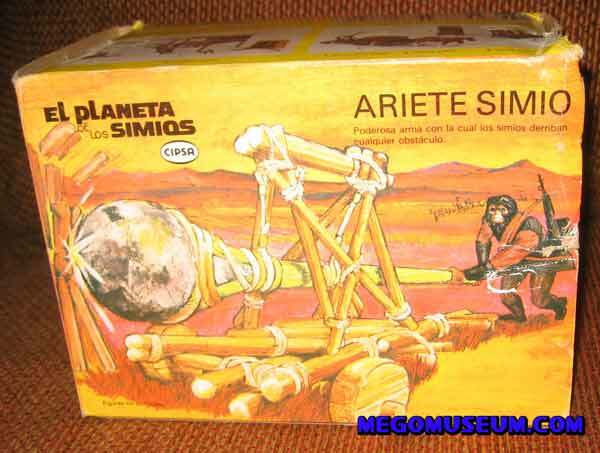 The back of the box depicts the entire Cipsa line, something the US box doesn’t do, it just repeats the box art on all four sides. 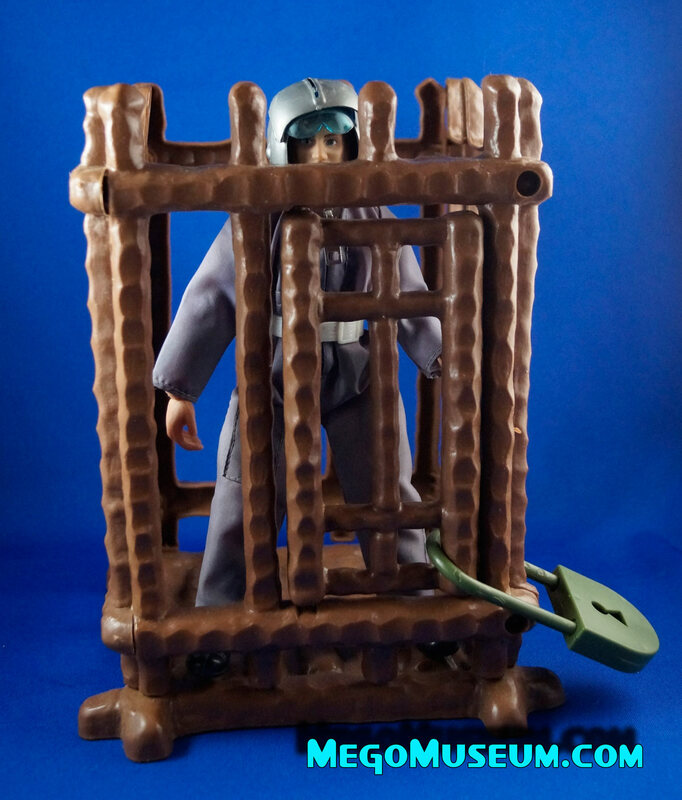 Here is the Cipsa Jail loose, it is a slightly different colour than the US version. I know it’s not terribly important but it’s important dammit. 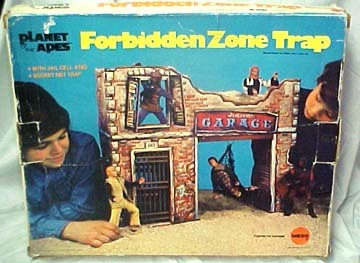 Other than that it’s indistinguishable from the US release. 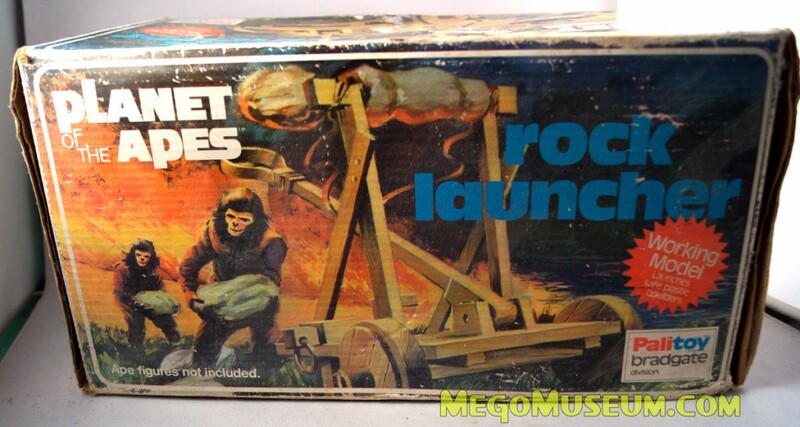 Rare Planet of the Apes Rock Launcher which was only available as a separate piece in the United Kingdom from Palitoy. 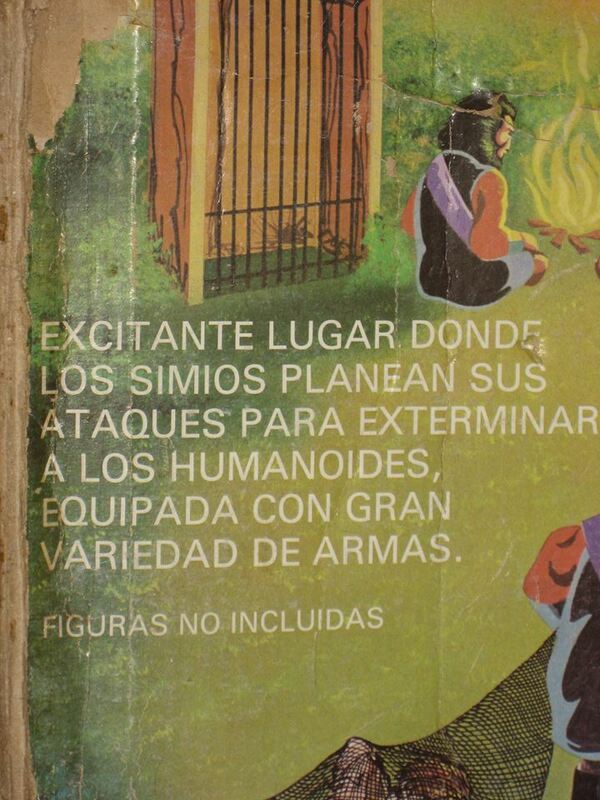 (ala Brain). 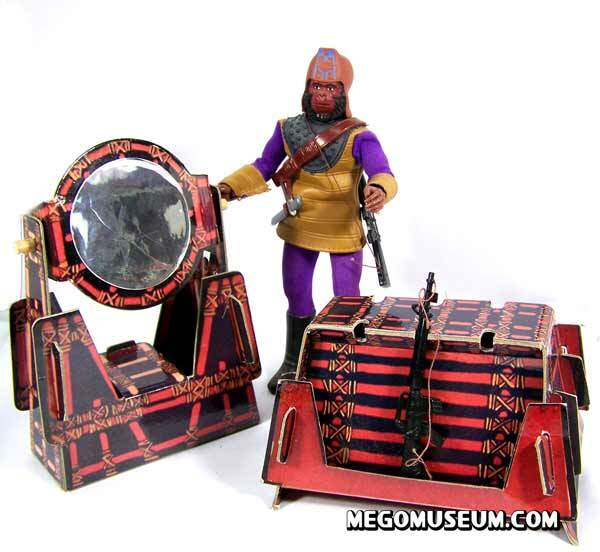 The artwork is of course, striking as all Palitoy card artwork normally is. 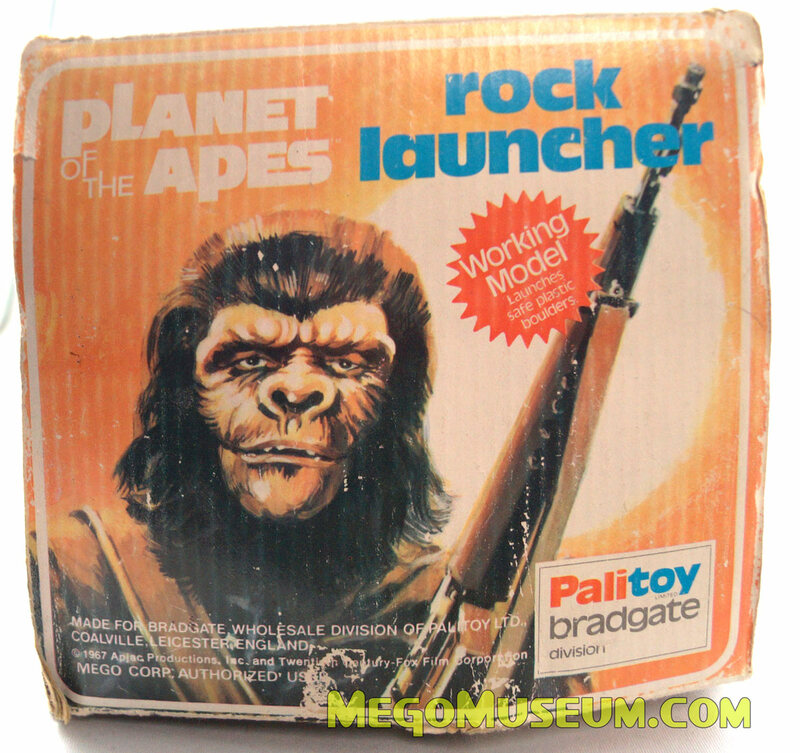 Planet of the Apes Rock Launcher by Palitoy. 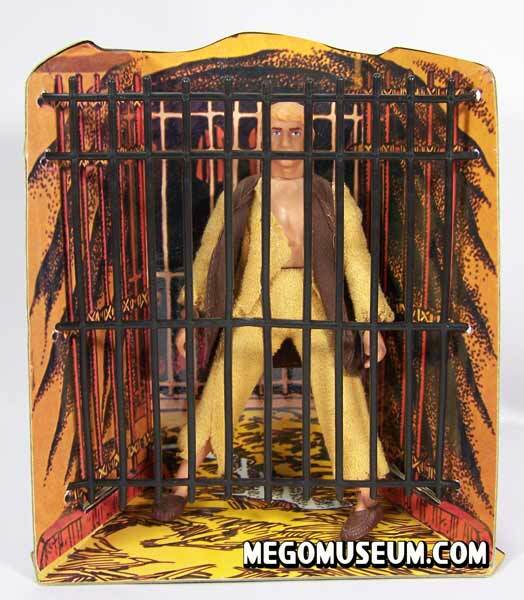 This is the only item that utilized the same artwork that the UK action figures did. 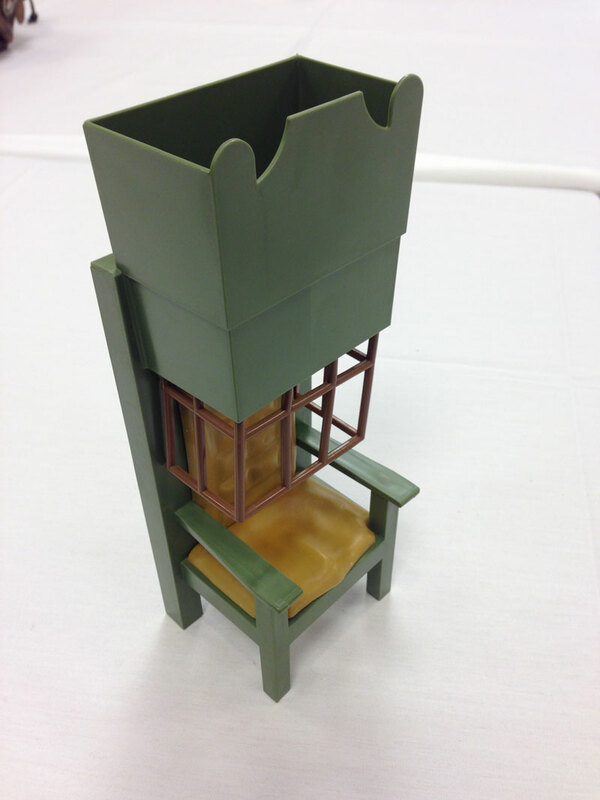 The Throne is a strange addition to the line, a chair that becomes a cage seems more in place with a Horror movie theme than with apes. 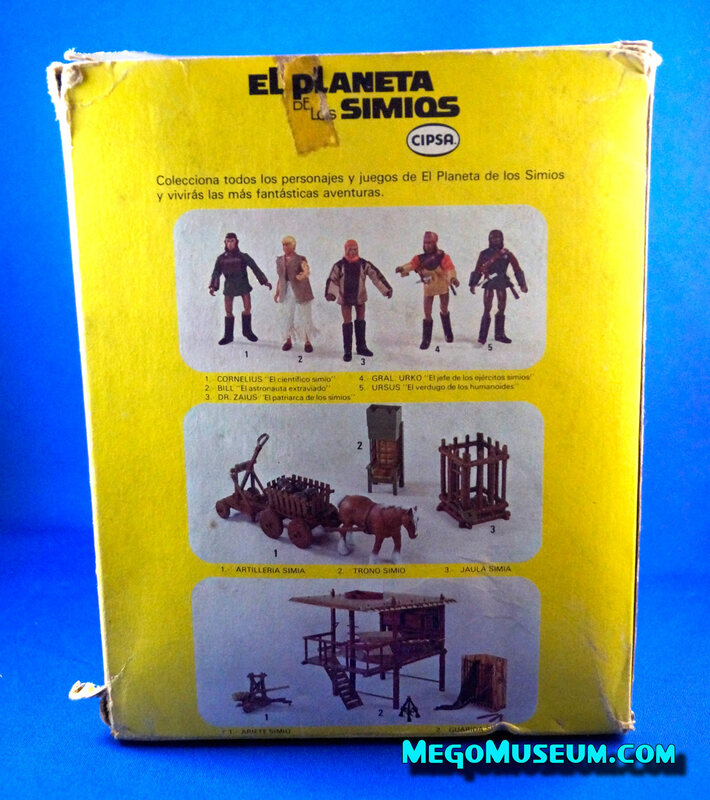 Here is the Mexcian version of the throne released by Cipsa, the box depicts the Astronaut, however this figure was not released in Mexico. 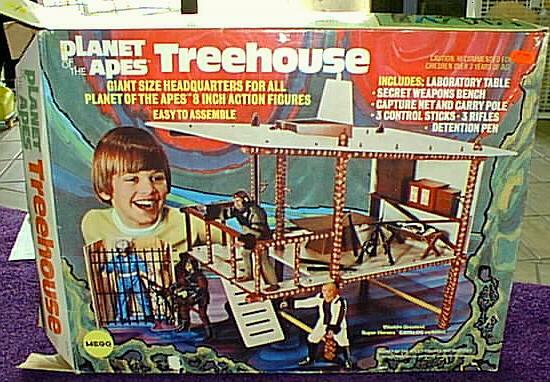 The Planet of the Apes Treehouse wasn’t based on anything in the films but was a repackaged version of Action Jackson’s Jungle Treehouse but seeing as Caesar lived in a treehouse in the previous year’s “Battle for the Planet of the Apes” it made perfect sense. 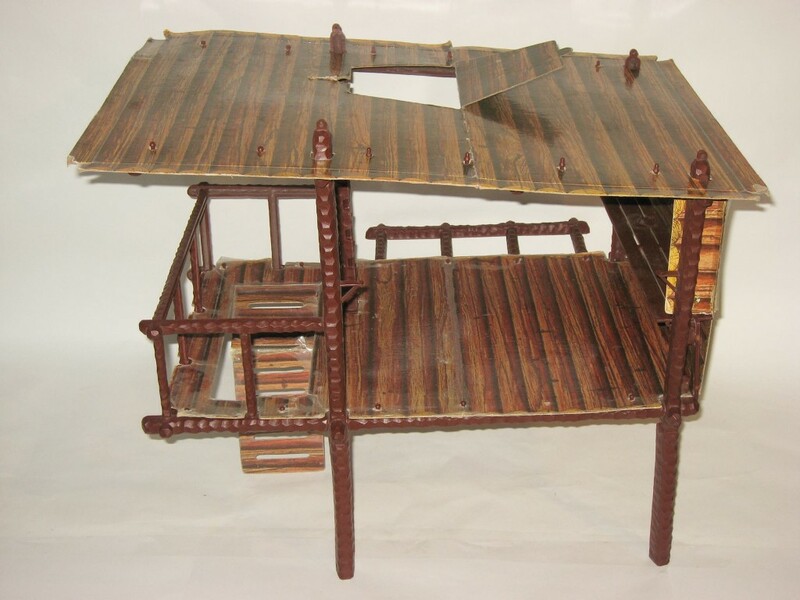 The treehouse was an incredible seller for Mego, in an October 1974 Playthings magazine the Treehouse was listed as “outselling comparable toys 20 to 1”. 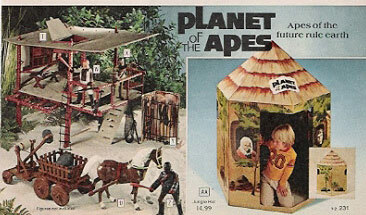 The Planet of the Apes Giftset included the treehouse and the first five figures in baggies, a very similiar concept to the Enterprise Gift Set. 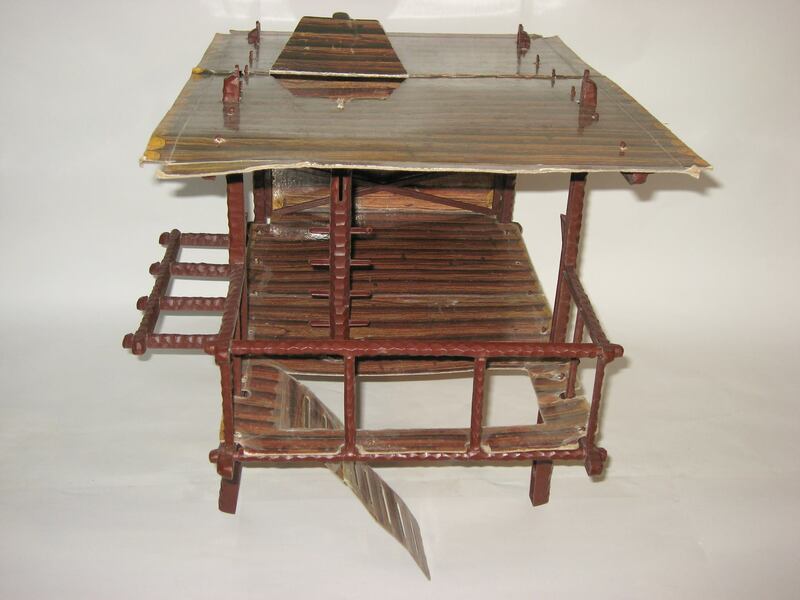 These gift sets are hard to find and are extremely popular. Photo courtesy of Mike D’Aloia. 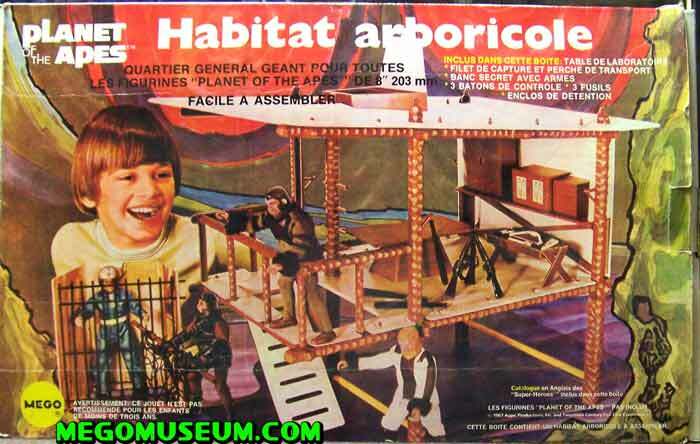 Parkdale Novelty (Canada) Treehouse Box (top) much like the Canadian boxed Enterprise Playset is much smaller than it’s US counterpart and a harder to find variation. 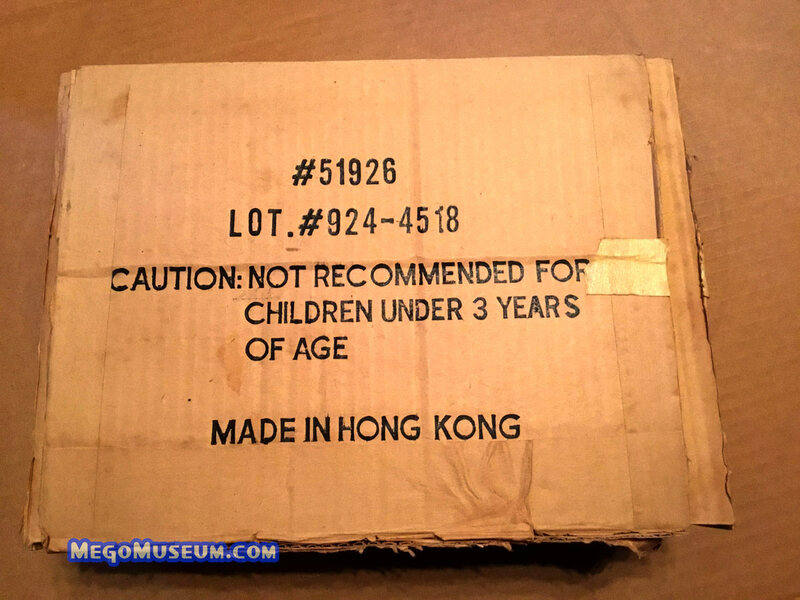 It’s always fun to highlight the french side of the box but the other side is in english. 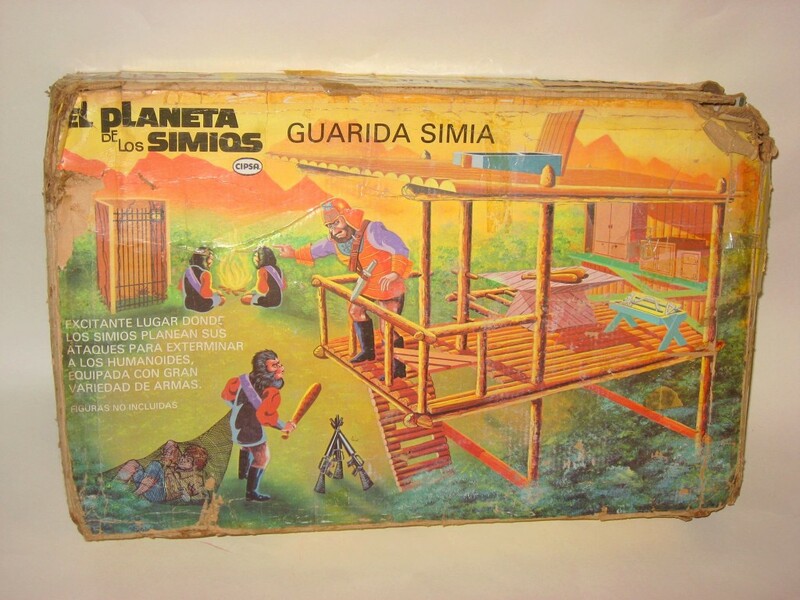 The Mexican version of the Treehouse features redesigned artwork, Urko sure looks mad. 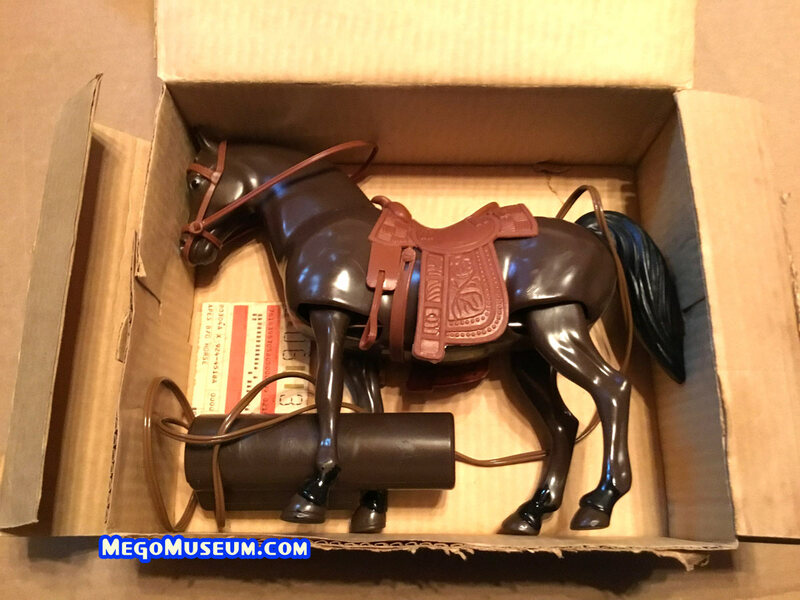 Special thanks to vintage toy guru John “Toyzilla” Marshall for all these fun photos and a welcome addition to the gallery. 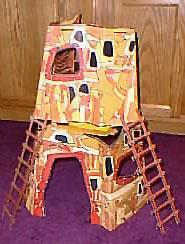 a painting of the wrecked Statue of Liberty on the back. 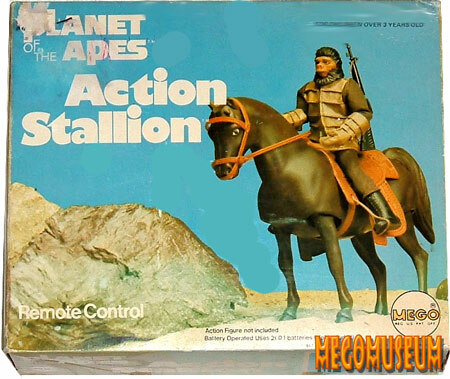 The Action Jackson Lost Continent Playset was another form for this set and actually was marketed as a Planet of the Apes piece! 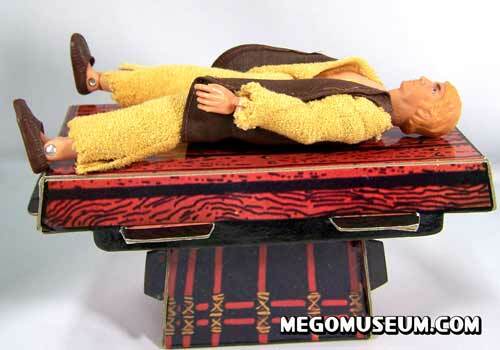 human dissection, and the victim on the table is a Phillip custom. 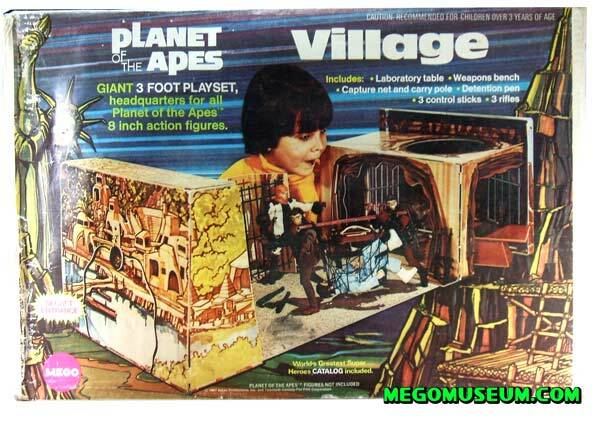 The village is rather large but it’s so striking to look at. NOTE: The Captured astronaut is actually just an Action Jackson figure.